After another throughly enjoyable viewing of the Food Channel‘s show “Good Eats” with Alton Brown, I was inspired to recreate Alton’s instructions for building a smoker from scratch. Alton runs a great show that mixes cooking with science — so you find out WHY to cook a certain way instead of just HOW — and he had a short tirade expaining why commercial cookers are substandard so he’d just build his own. (Friends of mine can request a full copy of the show from me — the rest of you can buy the DVD when it comes out.) Me and a couple buddies followed Alton’s lead and here’s the low-down. 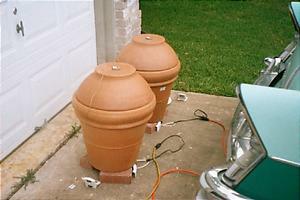 The structure of the smoker is a couple of large (25″ diameter) terra-cotta pots. One regular shaped flower-type pot and another bowl shaped cactus-type pot. The latter is inverted and placed on top of the former. Add a hotplate at the bottom of the pot, a heavy-duty pan to hold the wood chips, a replacement-grill from a kettle charcoal grill, and a replacement thermometer from a standard grill and you are set. One note, however: We loaded this all up the night before 7/4 and turned it on. It heated up to about 125 and then stopped working. We think the rheostat in the hotplate couldn’t handle the temperature inside the pot, so we dissassembled the hot plate leaving only the heating element (and essential parts) inside and running the rheostat out the hole in the bottom. All-in-all it worked really well, but I would be sure to use a remote sensor thermometer in the meat. Follow the guidlines in The Joy of Cooking or a similar basic cook book to determine the perfect temperature for whatever you cook. You can see two of these devices laying on the ground outside of these pots. We cooked about 5 different things this day and the ones that didn’t have thermometers were over-cooked. p.s. If you aren’t watching “Good Eats” and get the Food Channel, I highly highly reccommend this show. I would like to get a copy of that tape on the terra cotta smoker, or maybe a little more detail on your building of one. I think the terra cotta would hold the heat much better than a metal smoker. I would like more details on building the smoker, like are there supports made for the replacement-grill from a kettle charcoal grill? I thank you for posting this information. I like Alton Brown’s show for the reasons-he gives us the why not just the how. The inside of the pot has a lip that just happens to be the right diameter to hold the grill. Kismet, I guess. The top pot (lid) is _very_ hard to come by these days. One solution is to buy two of the bottom pot and use one as substitute for the lid. The pots I got were from Home Depot. Just assembled mine, working great with the Walgreens, 1000 watt hot plate. Lid choices see few.